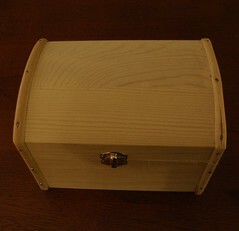 This box was created by Cheri from I Am Momma - Hear Me Roar and I saw it on a guest post over at Tatertots and Jello. 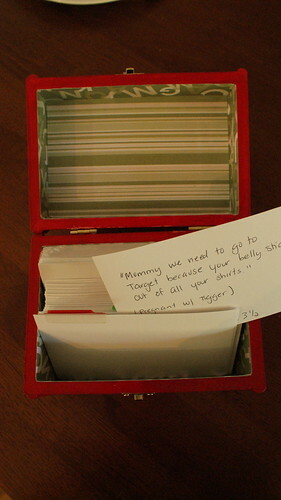 The box holds index cards with quotes from her kids. I love this idea because Snickerdoodle never stops talking and says some stuff that leaves us in stitches. I also thought this might make a nice baby shower gift. The process is probably pretty self explanatory but I'll include photos of what I did with a few words. 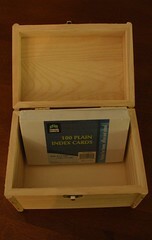 Get yourself a plain box, mine was from JoAnn. Make sure index cards will fit inside (or I suppose you could cut your own colorful paper to size). 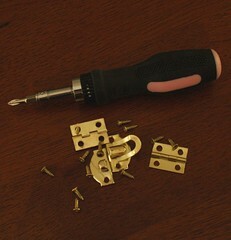 Lightly sand the edges to smooth things out and remove the hardware. 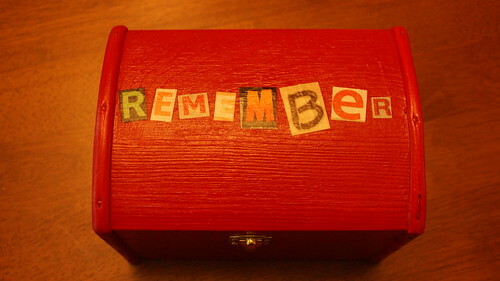 Cut out the letters for the word "remember" from a magazine then Mod Podge them on to the lid. Glue paper to the inside to line it. Mod Podge this in place as well. ... do the inside of the lid too. If the edges of your paper stick up above the edge of the box at all, carefully trim the excess using a razor blade. Add some index cards and when your kid says or does something you want to make sure you remember, take a moment to jot it down and stick it in the box. "Mommy we need to go to Target because your belly sticks out of all your shirts." For the record, it is really just the bottom of my belly and I AM almost 7 months pregnant.